I got this recipe from my auntie’s muffin recipe book last year back in Singapore, but unfortunately I only took a picture of the recipe and don’t know the book cover nor the author. I tried to find the same recipe book online but with no success. Back then, what caught my eyes was the flavor– rum and raisin! I had rum and raisin ice cream before, and so I thought the same flavor will taste good too on muffin (or even on scones!) The first time I tried out the recipe, I used the full amount of rum as directed in the recipe. 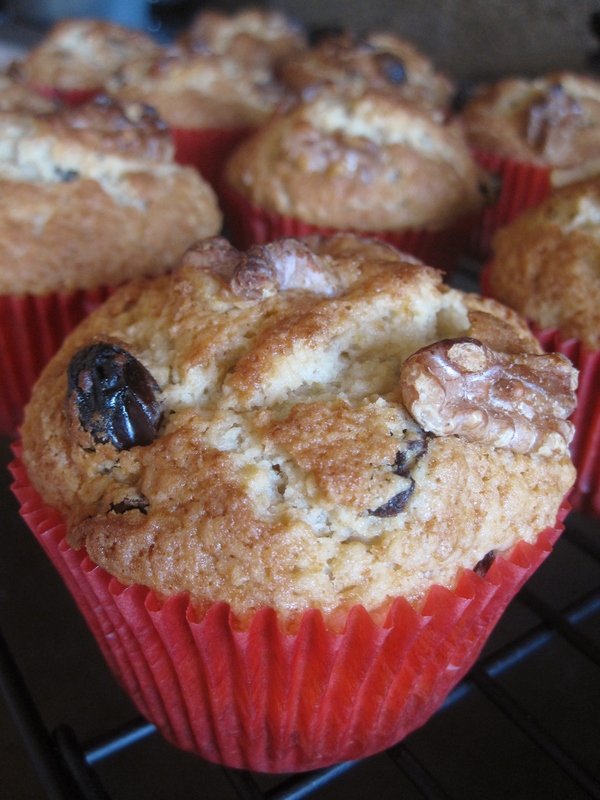 And let me tell you it’s very alcoholic– I could smell the alcohol coming out from the freshly baked muffins. Took a bite, the alcohol taste was there, and the rum flavor stayed in the mouth and throat even after eating the muffins. My husband was joking that he can’t drive to work after eating these muffins for breakfast. The original recipe uses muscovado sugar and demerara sugar, but I just used brown sugar. How about heavy cream? Nope, didn’t have that either– I used 2% milk. I think the milk made the batter very liquid-y like pancake batter. The texture of muffins turned out to be a bit dense. The flavor was awesome though. This time around, I changed cut down the amount of rum to 1/4 cup. Results? Much better. The rum flavor is still there but smooth to the taste. I also increased oven temperature to 400 degree F, just because I like my muffin tops crusty like cornbread. If you like rum and raisin ice cream, you may like this recipe. Soak raisins in 1/4 cup rum for at least 3 hours. Preheat oven to 400°F. Line muffin pan with muffin cup liners. Sift flour, baking powder and salt into a big bowl. Add in brown sugar. Mix to blend well. In a separate bowl, combine whipping cream, golden rum and eggs. Whisk to blend well. Pour cream mixture and melted butter to flour mixture. Fold in the batter with a spatula until just moist. Fold in raisins (including any residual rum that was not absorbed by the raisins). Spoon batter into muffin cups. Arrange some walnut pieces on the top. Bake at preheated 400°F oven for 20-22 minutes, until the muffin tops spring back when gently pressed. Remove from muffin pans immediately and transfer to a cooling rack. Best if the muffins are served warm. Whipping cream: You can use whipping cream or heavy whipping cream, or even thick cream like sour cream (combine with milk to 2/3 cup, mix well). If used only milk then the batter maybe liquid-y instead of thick batter, may make the muffins a bit dense. Oven temperature: I like the muffin tops crusty like cornbread crust, so I set to 400°F. If you are not picky like me, baking at 375°F for 20-22 minutes is just as fine.